Samba Kids Tees are Here! 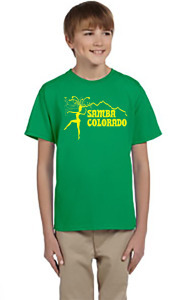 Samba Colorado Kids Tees are coming! We are pre-ordering now. Available are XS-XL in youth sizes. $12 per shirt or 2 for $20! You can pay by check or send $13 or $22 (for 2) via paypal to sambacoloradodance@gmail.com (including web tax). Let’s continue to share Samba Love throughout Colorado!